Okay, I know this post won’t apply to everyone, but with the new iPhone 5 coming out soon, hopefully it’ll apply to many of you. First, a preamble: I love games. Especially board games. I’m not much into hard-core video games, though. I don’t play World of Warcraft or Halo, and I don’t own any of the newest gaming systems. In fact, I had an iPhone for a year and a half before I downloaded a single game. I thought that playing games on my iPhone would be a complete waste of time. 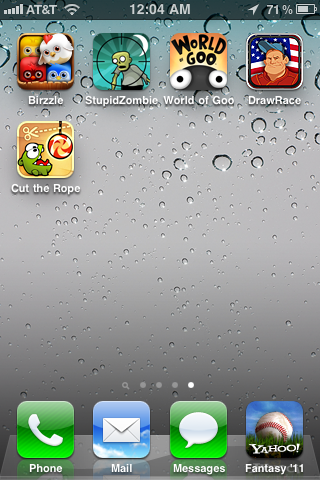 And in a way, iPhone games are time wasters. But most iPhone games are designed to just last a few minutes. You play a few rounds, advance with three gold stars, and then return at a future time. No big deal. Also, just to add a little bit of clout to the following list, I not only own a lot of iPhone games, but I also read a blog called Touch Arcade that reviews a ton of iPhone games every day. I kind of let Touch Arcade do most of the filtering for me, and then I try out the best of the best. Birzzle Warning: This is not a game that lasts just a few minutes. Not when you get good. It’s Tetris meets Bejeweled, but with birds, and a little more flexibility with where you can move the birds. Incredibly addicting. StupidZombie You may have heard of a little game called Angry Birds. But the much lesser-known StupidZombie is way better (and a little different). From a single position on the screen, you shoot a limited number of bullets at zombies scattered across the screen. You try to take out all of the zombies with as few bullets as possible. It’s tons of fun trying to maximize each bullet and shoot around obstacles, and the bullets bounce off the walls, so an errant shot can sometimes produce surprising results. A must-own. World of Goo The physics of this game is incredible. You build structures using little balls of goo–towers, bridges, cranes, etc. It’s a little tough to describe, but I guarantee you’ll find this one fascinating. It’s even better on an iPad. Draw Race This game is incredibly simple and admittedly grows old, but it’s such a cool concept that it deserves a spot on the list. You’re presented with an empty racetrack on which you draw your car’s eventual path. Then you pass the phone to a friend and have them draw their car’s path. Finally you press “Go” and watch the two cars race against each other as they follow the path you set for them. Really interesting concept. Draw Race 2 just came out and vastly improved the graphics, so that’s probably the one to download. Cut the Rope A piece of candy dangles from a rope, and your job is to get it into the mouth of the monster waiting at the bottom of the screen. All you have to do is swipe your finger across the rope to cut it. It starts out simple, but with a variety of obstacles and ways to move the ropes and the candy, this game can keep you entertained for hours (spread across many days). What are some of your favorite games that are missing from this list? This entry was posted on Thursday, September 15th, 2011 at 12:16 am	and is filed under technology and tagged with technology. You can follow any responses to this entry through the RSS 2.0 feed. I agree with world of goo. I have it on my Wii and it is one of the best games I have played in a long time. Interesting. I’m curious about how it works on the Wii. The touch screen really helps for a drag-and-drop game, I think.